In 1824, a group of people thronged the home of Oxford professor William Buckland. They reported to the professor the finding of a large jawbone from a quarry not far from his quarters at Oxford University. Buckland had by then acquired fame as a geologist with a keen knowledge of fossils. Two years earlier at an Oxford meet he described a feeding frenzy of ancient hyenas based on fossil remains at Kirkdale Cave in North Yorkshire. The Oxford geologist named the fossil found in his home Megalosaurus, or a Great Fossil Lizard. Buckland was somewhat of an oddity: unlike the scriptural geologists of his day, he did not hold to a literal interpretation of Genesis. Though he rejected evolution, Buckland acknowledged the earth supported life long before the existence of humans. But he was also a deeply religious man who devoted much of his life to make geology palatable to the faithful. In one lecture, he tried to imitate the movement of giant lizards, saying there was something divine about their gait. The moniker dinosaur was coined 18 years after the English geologist described the giant lizard. 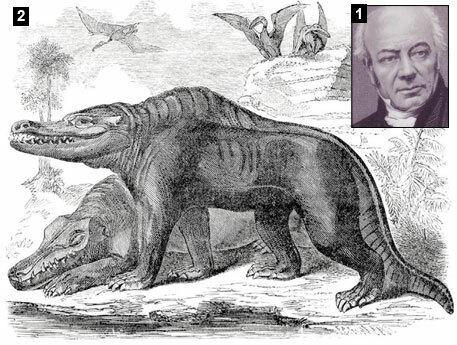 In 1842, the paleontologist Richard Owen combined the two Greek words deinos (“terrible”) and sauros (“lizard”). Owen, like Buckland, loved making fossils popular. But his methods were vastly different. 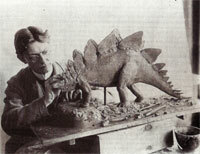 A friend of the British royal family, Owen got to oversee the construction of prehistoric life at Crystal Palace Park, where he helped create the first life-size sculptures of dinosaurs. He lobbied with the royal family to establish the natural history section at the British Museum—now the Natural History Museum of London. Theme parties around fossils became popular. 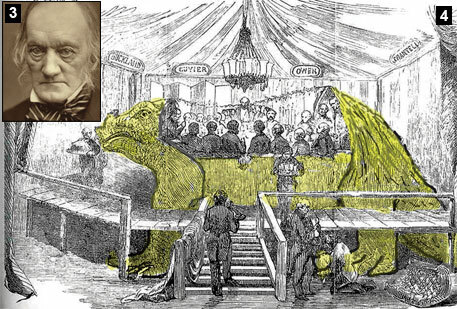 Owen hosted extravagant parties in the belly of a reconstructed iguana. Owen’s Crystal Palace exhibition catapulted sculptor Benjamin Waterhouse Hawkins to fame. 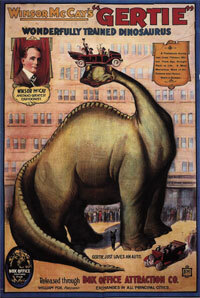 And by the late 19th century, museum directors wanted dinosaurs to popularize their institutions. Artist Charles R Knight’s representations in the American Museum of Natural History became popular. By the second decade of the 20th century, improvements in casting allowed dinosaur skeletons to be reproduced and shipped across the world for display in far-flung museums.